Mr Coens, some weeks ago, Port of Zeebrugge, Port of Calais and Getlink (Channel Tunnel), Port of Zeebrugge were invited to the Treasury Committee at the House of Commons in London. What was the purpose of your visit? The members of parliament wanted to hear from us what we thought would be the implications of the Brexit. They also wanted to know how our preparations are going on, what we are doing and what our contacts are within the British Government and Institutions. Quite obviously we had to clarify in what kind of uncertain environment we have to prepare our ports. We know the Brexit is coming but for several issues we don’t know exactly what it will mean, and what the effects will be. Photo: Interview with Mr Joachim Coens, CEO Port of Zeebrugge, Friday 22 June 2018 Mr Coens was one of the speakers at the Ferry Shipping Summit 2018. So basically you are getting prepared but you cannot prepare everything since there still is a grey zone? Indeed, we have been preparing for the worst-case scenario, even if it is unclear what ‘worst case’ means. We don’t fully know the timing either. Still our aim is to create a Brexit-proof port. Managing unaccompanied freight will be relatively easy. We have closely worked together with the custom services, and we have created a digital data platform in cooperation with the private port community. The most urgent thing now is that the Belgian/European custom services have to have a dialogue with their UK colleagues. Brexit starts next year (on March 29), and a two-year transition period is fine, but at least we need to know the framework in which to act and operate. What is the purpose of this digital data platform? Through the use of barcodes we want to streamline the cargo flows. When cargo is entering the digital platform it gets a digital waiver from the customs. When entering the terminal, freight can just drive through, thanks to this digital code. Checks will only be needed for cargo that hasn’t been automatically entered into the system. Is this platform something developed exclusively for the traffic on Great Britain? In fact it is suitable for all ro-ro traffic. Obviously the most urgent thing is now the UK. Within the European Union we enjoy the free movement of goods. When Britain becomes a third country there is no longer such a freedom. As a result each transit of goods will have to be approved by the several authorities and eventually checked. If we can organise this flow digitally, then the main effort will go in checking the use of the digital platform, rather than checking all the cargo. The port, the ferry companies, the customs, together you must have a clear view on the challenges and solutions. What about the freight customers of the ferry companies? Are they aware of what they need to do to export their goods to the UK, after having had the luxury of a borderless Europe? Creating awareness is something we are working on, in cooperation with the customs. Indeed many companies are not used to export to third countries, outside the EU. I am thinking especially the smaller companies who are having a modest export to the UK. Is the Port of Zeebrugge going to have extra customs officers? Indeed, we’re getting 141 extra staff members. But this takes time, to recruit, to educate etc. We are also creating a customs information centre, for businesses that want to trade with the United Kingdom. People that have questions can already forward them to our special mail address: brexitproof@portofzeebrugge.be . Does the port have enough terminal space in case of ‘administrative’ delays? Our advantage is that we mainly deal with unaccompanied ro-ro freight. We don’t have to cope with waiting truck drivers. Most freight is being dropped off in the port. Zeebrugge can handle quite a lot of freight. In the unlikely event of an inspection of all 4,000 lorries a day, then of course we’re going to have a long queue. For a total blockage we can cooperate with the (new) car terminals to extend the available marshalling space. In contrast to Zeebrugge’s positive, Brexit-proof attitude we read a lot about the fear in Britain for huge blockades, like for example in Dover. Indeed, there is nightmare scenario with trucks and their drivers using a stretch of the M20 in Kent as a temporary lorry park. I think the biggest fear of the UK is the supply of the island. A lot of products, like food supplies, are very sensitive and can’t cope with delays. Think also the supply for the automotive industry, with parts being delivered just in time. These production processes are having a tolerance of a couple of hours. They cannot suddenly start to build huge warehouses to store goods three days in advance. Can you say that Zeebrugge is lucky to have more unaccompanied freight, compared to for example Hoek van Holland or Calais? In a way yes, but Just in Time is very important too, for the production processes. 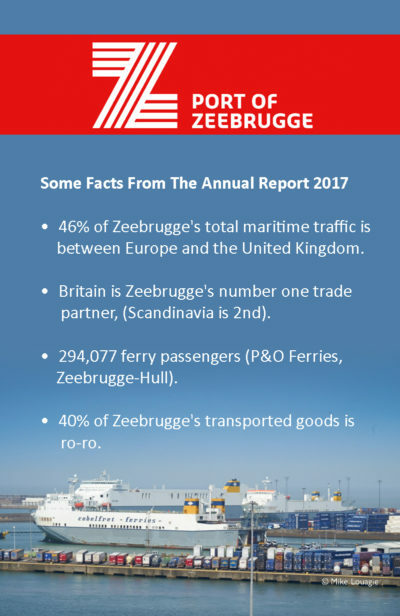 What kind of opportunities does the Brexit create for Zeebrugge? 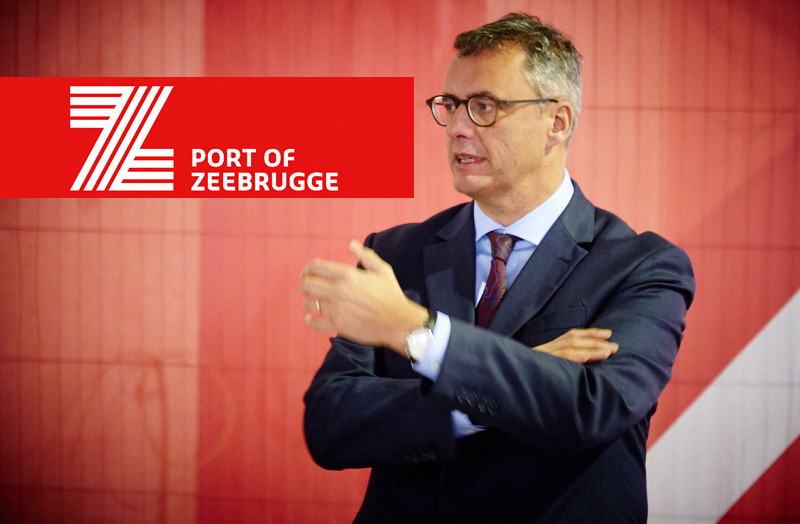 Zeebrugge has always been an efficient ferry and ro-ro port, and with the ever-improving digitalisation we have the intention to remain as efficient. The traffic to Ireland is another opportunity. Now a part of the cargo transits via the UK. More could be done via direct links to Ireland. On the other hand I would say trade barriers don’t create a lot of advantages. Barriers are not a wealth-creating concept. So many businesses here can’t afford to lose Britain as a customer. A country with 70 million inhabitants cannot be replaced by something else. Don’t you think the British people will just continue to have the same needs? Yes. However what could happen is a reduction in spending power, because of the €/£ exchange rate, and the possible economic situation in Britain. If you have less money to spend you buy less, and you buy in a more selective way. That could mean less European products. Do you expect the creation of new factories and production centres in the UK? There is a possibility of a slight increase in local production, with an opportunity for us as a port, by virtue of the increased import. For producers on the continent it is less interesting, but I don’t see it happen immediately. Britain might have difficulties in finding enough people to work. Now many Europeans are working in Britain, but what if they leave? Some sectors might get in trouble, like the transport sector. Several industry specialists see an opportunity for small ports on the British side, especially to cope with the problem of possible congestion. What’s your opinion? On the one hand I understand that it could be a solution to spread the traffic over several ports to avoid blockades. On the other hand, will the infrastructure of these ports be adequate to receive the new generations of ro-ro ships, which are become larger and larger? If you see the new ro-ro ships from CLdN, with 7,800 lane meters, they cannot get in too many ports. What I do see happening is a further consolidation in the transport sector. All new barriers such as borders, tariffs… will create an increase of costs. The big players can absorb these costs by their economy of scale. If CLdN brings in ships with a 50% higher capacity, they can save on costs. This trend will be necessary in response to the barriers, and that is not always compatible with smaller ports. Can you say something about the ferry link to Scotland, which was recently ended by DFDS? The link to Scotland started as a passenger ferry service by Superfast Ferries. Then it became more freight-oriented. Although we always had stable passenger and freight carryings on this route it was not easy to break even. The distance cannot be underestimated. P&O Ferries have now put more capacity on Zeebrugge-Teesport to catch this traffic. Still I do hope that a new link with Rosyth remains possible, because it is a country on its own, with its own ambitions and its desire to have a connection with the European continent. A ro-pax would be ideal since Scotland is an important tourist destination. The cargo is there, the passengers are there, but the costs are there too. A solution could be to look at the cost side of the operation, possibly by having larger ships.